As you can see, we have the bald haircut, afro, long hair and short hair. While hairstyle options are rather low and we´ve got no beards either, we can manipulate face variation quite decently. Basically, the body would be the same, except using different textures for different races. Not sure how easily this all translates to how OpenMW wants the body to be in pieces, though. It seems the thighs are too together. We can fix that easily though. Alright guys, I´ve got some news. Our skeleton doesn´t import, so that means we are making our own custom skeleton in Blender 2.49B. I´m going to have work for the next 3 days, but I´m sure I´ll be able to at least import a fitting model into the game. Fortunately the rig process is easy enough, so I might even add a skeleton. Maybe some other enthusiast is up to the task? I almost thought I got the skeleton imported, but some really weird stuff happens + right side of the skeleton (arm, leg) is lost. This definitely looks like you´d need to start from scratch unless you want every animation that bows to also make your eyes jump out. The way those bones are connected is messed up. Works alright in Blender 2.76 of course. DestinedToDie wrote: I almost thought I got the skeleton imported, but some really weird stuff happens + right side of the skeleton (arm, leg) is lost. Peep the mocap files in my signature. The skeleton works just fine. Be sure to remove the Y and Z (Edit: and X) location transformations on the "Hips" bone. I've got this test model working in Blender, but NIFskope shows the rig moving while the model stands still. Not sure what else I need to do, but if anybody wants to take a look at it and document your steps to get it working, then I can get a better model with better weight painting and tweak the animations to get this thing rolling. P.S. I just got offered a new job and will be moving in the next few weeks, so the sooner we can get the kinks worked out of the workflow, the more I'll be able to accomplish before my free time disappears. How did you import .obj format to Blender 2.49B and still keep the skeleton? 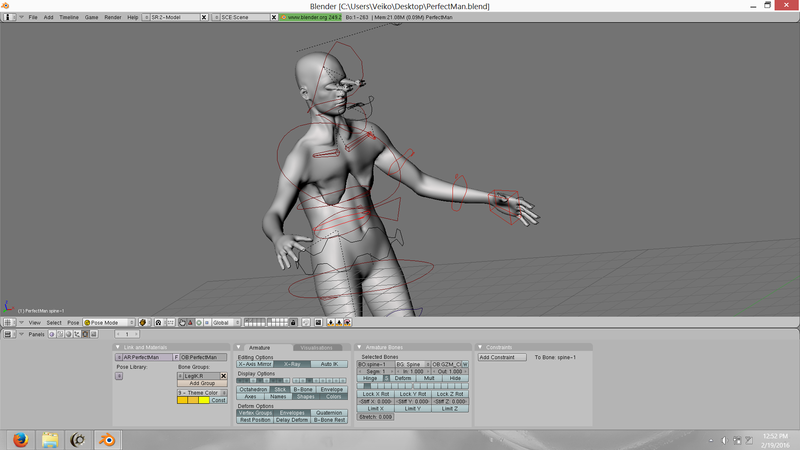 DestinedToDie wrote: How did you import .obj format to Blender 2.49B and still keep the skeleton? In case anyone else is wondering, the skeleton was from a .bvh mocap file. The licensing, usage, and availability of these mocap files is currently under review. Consider it a placeholder for testing purposes just to figure out the workflow/pipeline for getting animations from Blender into OMW (currently unsolved, to the best of my knowledge). Anyway, here's progress on a model. I still need to fix the smoothing, apply materials, and close up the gaps in the joints, which I'll tackle soon. Does anybody have an idea of what kind of poly count we're looking for? MakeHuman puts out high-quality meshes around 36K triangles, and low-poly meshes with around 3K. I'm working with a low-poly mesh for testing purposes, but I have no problem upgrading if that's desirable.